Christmas music is special when it comes directly from Santa. Hidden deep in the North Pole Santa Radio is the only radio station delivering your favorite Christmas music 365 days a year directly from Santa’s basement. Santa Radio is a mix of Santa’s favorite Christmas classics along with the latest Christmas hits that keep his elves tapping their toes. This is the only radio station officially endorsed by Santa’s elves union local #1225. 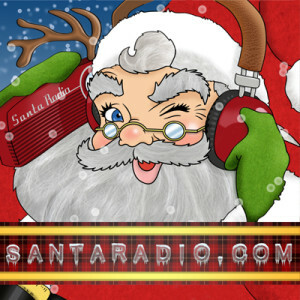 At Santa Radio you can hear your favorite traditional Christmas songs sung by the likes of Bing Crosby, Ella Fitzgerald and the Carpenters, to today’s hottest artists like Kelly Clarkson, Lady Antebellum and Mrs. Claus’s favorite Michael Buble. Let Santa Radio set the mood at your next Christmas party, or tune in anytime you want to create the perfect festive atmosphere in your home or office 365 days a year. Santa Radio also has fun on-line games, e-cards, recipes, trivia and more, all inspired by the merriest time of the year. So sit back and relax with a cup of hot cocoa and get into the spirit of the season here at Santa Radio!